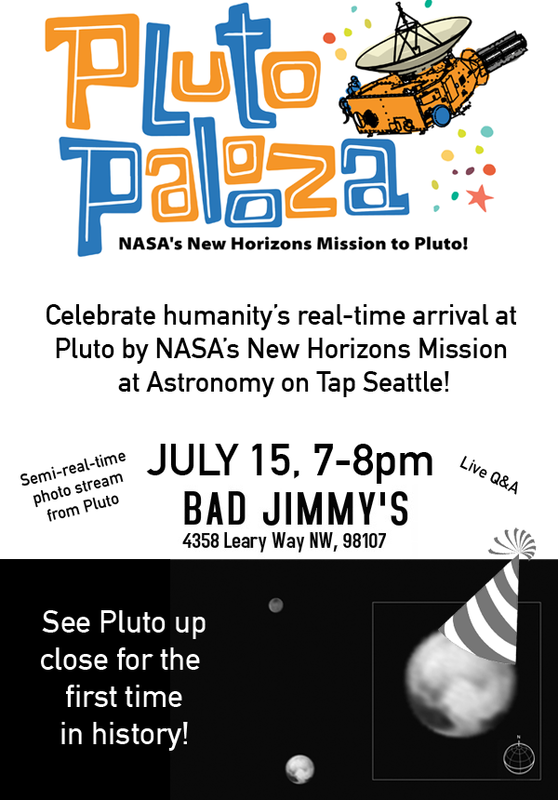 On July 15th from 7-8 pm Astronomy on Tap Seattle will present a special event: Pluto-Palooza at Ballard’s Bad Jimmy’s. THIS MONTH we’ll be holding a special Astronomy on Tap meeting on July 15th to celebrate NASA’s New Horizons mission to Pluto, which arrives on July 14th. Hear about the history of Pluto and see the most up-to-the-second images returned from the Pluto system including its many moons Charon, Styx, Hydra and Kerberos (and any others discovered in the coming days)! Celebrate humanity’s first visit to Pluto with plenty of beer and live Q&A with astronomers. Don’t miss this special event and be sure to follow us on Twitter and Facebook to get updates on future events! Please RSVP on our eventbrite page.